If we look back into time, we will be reminded how joyful we were when Samsung was about to launch its first Note smartphone, and the continued success of the Note series released every year into the market. Samsung is set once more and about to release the Galaxy Note 8 in preparation for its inception in September during the IFA in Berlin. From the first look at the phone, you will discover the similarity between the Galaxy Note 8 and the Galaxy S8 Plus. 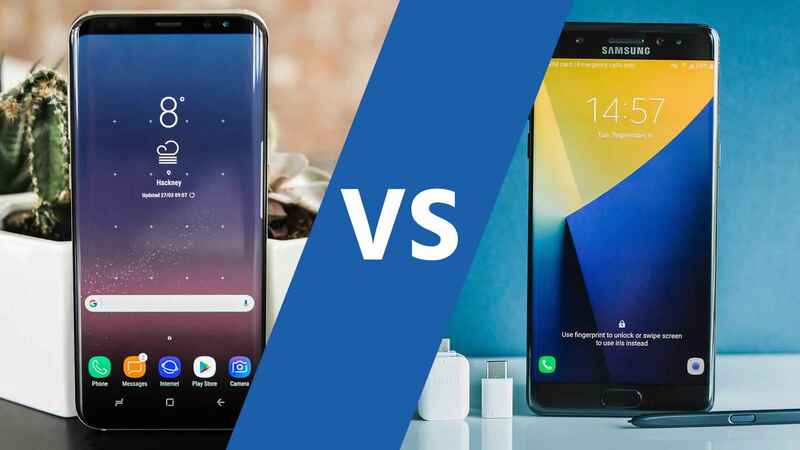 We will be comparing this two giant smartphones with each other because they certainly fit for comparison, although the Note 8 features a screen size of 6.3 inches and the Galaxy S8 Plus 6.2 inches. Before starting this little comparison, we will first show you at the beginning specifications of each phone in the following lines then we will clarify the differences between the two phones. Date of announcement: March 2017. Phone Body: The phone is made of metal covered with a glass layer protected by the fifth version of Corning Gorilla glass. Phone Dimensions: Length 159.5 mm, width 73.4 mm, thickness 8.1 mm. Operating System: The phone is running the seventh version of the Android 7.0 operating system (Nougat). Phone processor: The phone features a powerful eight-core processor from the Qualcomm American industry of Snapdragon 835. Battery: The phone has a 3500mAh Li-ion battery, non-removable and supports fast charging. Screen Type: The phone comes with a Super AMOLED screen. Screen size: The phone features a 6.2 “screen covering 84% of the phone surface. Screen Quality: The phone has a 1440 * 2960 pixel display, with a density of 529 pixels per inch and supports 16 million colors. Screen Protection: Corning Gorilla v5 protects the screen. Multi Touch on Screen: The phone supports touch. Random RAM: 4 – 6 GB. Internal memory: 32 – 128 – 256 GB. External memory: The phone supports a port for the external memory card. Rear Camera: The camera comes with a 12-megapixel camera with an f/1.7 lens and dual LED flash. Video Recorder: Supports are shooting 2160 pixel video at 30 frames per second and 1080p at 60 frames per second. The Sylvie front camera: 8 megapixels with f / 1.7 lens slot, and 1080p video shooting at 30 frames per second. Bluetooth: Works with the fifth version 5.0. Connectivity: Supports 4G LTE connectivity. Phone structure: The phone is fully designed from metal and covered with a glass layer, the phone length is 162.5 mm and width 74.8 mm and 8.6 mm thickness, the phone weighs 195 grams. Screen Protection: The screen is protected by a glass layer of Corning Gorilla version V resistant to scratches and fractures. Phone Processor: The phone features a powerful eight-core processor from Qualcomm American Snapdragon 835. Connectivity: Samsung Galaxy Note 8 supports 4G LTE connectivity. Connectivity chip: Connects to two contact pieces of the Nano-SIM Nano size. Rear Camera: Features 12-megapixel dual-sensor camera The first f / 1.7 and f / 2.4 f / 2.4 lens supports auto focus and dual LED flash. The Sylvie front camera: 8 megapixels with a f / 1.7 lens that captures 1440-pixel video at 30 frames per second. Wi-Fi supports connection to Wi-Fi networks a / b / g / n / ac. Bluetooth: Works with Bluetooth 5.0 version. The two phones are made of metal, and the two are covered with glass veneer of the 5th version of Corning Gorilla glass. The edges are almost non-existent. The screen covers most of the surface of both phones, although both phones have the same design in the construction. The Galaxy Note 8 includes the Samsung pen known as S Pen, and both phones have obtained the IP68-certified certificate of water resistance and dust. Galaxy Note 8 comes with RAM of 6 GB, while there are two versions of the Galaxy S8 Plus, the first 4 GB RAM and the second 6 GB RAM, although Note 8 has a larger random access memory (RAM), but comes with a smaller battery capacity. The Galaxy S8 Plus has a 3500 mA battery. Both devices support fast charging. Some do not know that the reason for the low capacity of the battery is that the S Pen takes up space from the body of the phone, which is a primary cause of the small battery capacity. There is no difference between the rear camera of the two phones. It ensures a 12-megapixel camera with the same sensitivity as 1.4 μm. The phones feature 4K video at 30 frames per second, Full HD at 60 frames per second, Megapixel and f/1.7 lens slot. There are no big differences between the two phones when it comes to specs, but the big difference will be the price as Samsung has put its Galaxy S8 Plus at 700 euros. Samsung is expected to launch its Galaxy Note 8 at 1000 euros.